These gorgeous after dinner treats are prepared by our guest chef Sue McTighe. 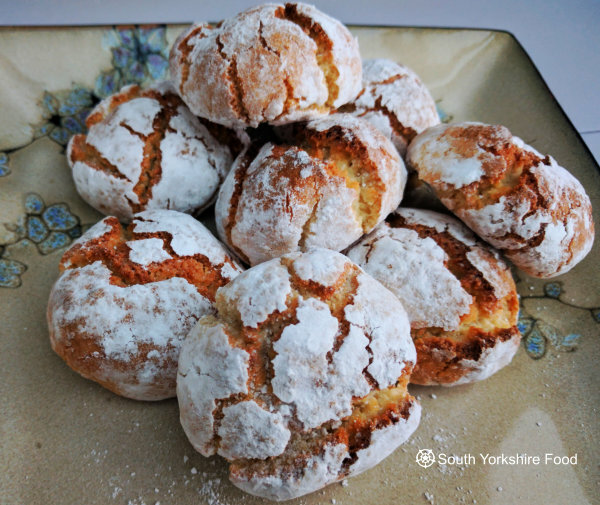 Light Italian biscuits that are crisp on the outside and slightly chewy inside. Absolutely heavenly! icing sugar for rolling and dusting. Preheat oven to 180C gas mark 4. Whisk the two egg whites by hand until combined and frothy. Then add the caster sugar. Using an electric whisk beat until you have soft peaks. This doesn't take too long. Mix in the ground almonds, and either the honey, or ginger syrup. The dough will resemble marzipan. Scoop into dessert spoon size pieces and roll them into balls with damp hands to minimise sticking. You should get 18 x 30g balls. Roll in icing sugar and leave for 10 minutes to absorb some of the sugar. Then roll them in the icing sugar again, and set on 2 lined baking trays. Bake for 16 to 18 minutes until golden brown and a little cracked. They will puff out a little as they​ cook. Leave them to cool a little, and dust with some more icing sugar.